Cheim & Read is pleased to open the fall 2003 season with an exhibition of new paintings by British artist Alessandro Raho. 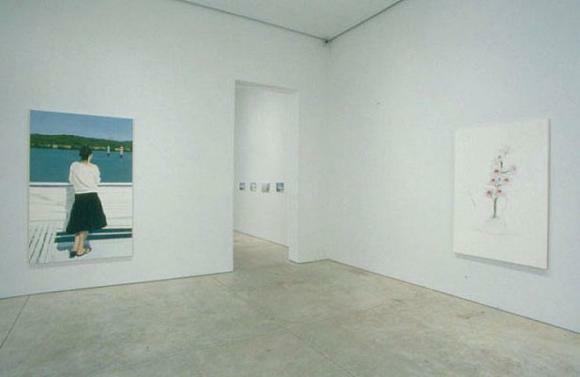 This will be Raho's first show with Cheim & Read, and his first in New York since his debut exhibition here in 1996. The exhibition will open on Wednesday, September 10 and continue through October 11, 2003. Alessandro Raho was born in Nassau, Bahamas in 1971, and graduated from Goldsmiths College of Art in London in 1994. He continues to live and work in London. Raho is best known for paintings of people, for which he uses his friends as models. Working from his own photographs, the artist generally paints the subject evenly lit, silhouetted in the center of a white ground. As early influences he cites Richard Avedon's photographs (for their plain white backgrounds), the paintings of Alex Katz, Andy Warhol and David Hockney, and contemporary advertising images. Comparisons to Manet have also been made. Despite the self-conscious stylishness of these sources, Raho's work eschews overt "style" in favor of a seemingly affectless, straightforward approach to the subject and the handling of paint, and his aim seems to be nothing more, or less, than to give a convincing image in paint of the human subject. The skill, sympathy and restraint with which he succeeds in this time-honored goal, and the direct gaze with which most of the subjects confront us, make the paintings compellingly engaging. That they also have their own insouciant stylishness is somehow the least of it. In recent years the artist has expanded his repertory to include landscape and still life subjects, and several of these are included in the exhibition at Cheim & Read. Whether large (up to nearly 6 x 4 feet) or quite small, the offhand subject matter and casual framing of Raho's landscapes stand in marked contrast to the self-imposed formal strictures of his portraits, and bring to mind the 19th century plein-air oil study, or the 20th century snapshot. In CATHERINE IN AVIGNON, he introduces into the landscape a woman, dressed and posed with exquisitely measured casualness, whose back is turned to the viewer in a manner reminiscent of Caspar David Friedrich's figures communing with nature. With the show's single still life, the extraordinary ORCHID, Raho returns to the studio and to a cool and straightforward presentation of the subject, which paradoxically transforms the single, enlarged spray of bloom into a startling apparition.